Alfred George Brett (baptised as George Alfred Brett) was born in Suffolk and emigrated to Canada in 1930 as a 15 year-old. During the war he served in a specialist squadron involved in the supply of covert forces behind enemy lines. He was killed in an aircraft crash in India in April 1945. His parents lived in Lower Anchor Street, Chelmsford. Alfred was born in Barton Mills in Suffolk on 14th April 1915, the son of Charles Alfred Brett and Clara Harriet Brett (nee Ford). His parents had married in 1907. Alfred's siblings included: Henry Charles 'Harry' Brett (1908-1999), Dorothy May Brett (1910-2007),Robert George Brett (1912-1997), and Philip George Brett (1923-2005). On 8th August 1930 Alfred arrived in Montreal, Quebec, Canada as an immigrant on board the ship Albertic. The vessel had sailed from Liverpool. He claimed to be aged 16 and his occupation in England was said to have been as a gardener. He intended to work in farming in Canada. His next of kin was his mother, then living at The Lodge, Great Ruggins in Wickham Bishops. During the war Alfred's father served as a Senior Air Raid Warden in Chelmsford's B14 Sector. For his actions in the Chelmsford Blitz of 14th May 1943 he was sent a letter of recognition from the Eastern Regional Commissioner for Civil Defence, Sir Wil Spens. Alfred served as Pilot Officer (Air Gunner) J/94957 in 357 Squadron, Royal Air Force, a special squadron, involved in the supply of covert forces behind enemy lines. 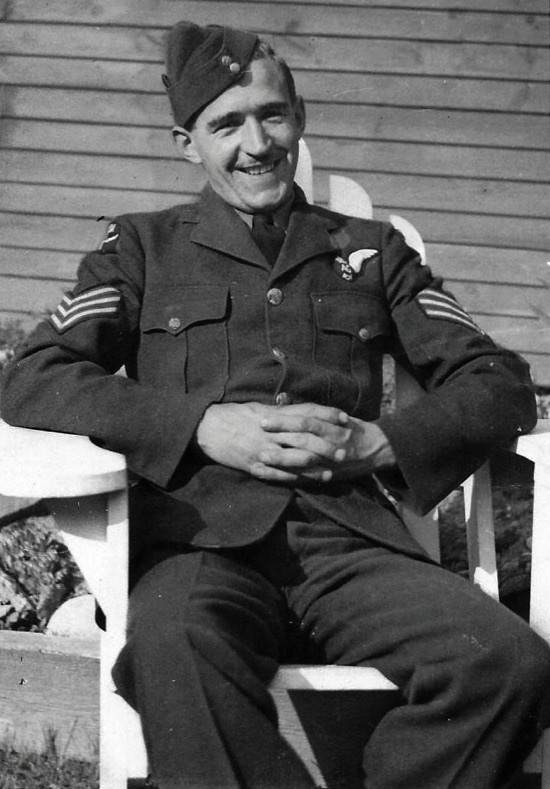 He had joined the air force after he heard that his eldest brother, Harry, had been taken prisoner of war. Just prior to his death he visited England and was able to meet his sister Dorothy at Liverpool Street Station in London for coffee before continuing his journey to Chelmsford. He had been due to spend a week with his parents but was recalled after just one night. Aged 29, he was killed on 1st April 1945 at Digri in India (today part of Bangladesh). It is believed that he was on board a Liberator aircraft that crashed soon after take-off. At the time his parents were resident at 10 Lower Anchor Street in Chelmsford. Alfred was married to Geraldine Bertha Brett, of Leskard, Ontario, Canada. Today Alfred lies in Chittagong War Cemetery in Bangladesh (grave: 3. F. P.). His father died in 1968; his mother in 1977.